We got some beautiful new HDPE tubing and have enough to make some custom sizes for folks. Set up an appointment for a costume fitting at our studio in SoMa on Mission Street (953, between 5th and 6th) for your own personalized hoop. Your purchase includes a 20 minute hoop fitting consultation and mini lesson to get you started with some hooping instruction and an opportunity to try out various size hoops to see what feels comfortable for your body. 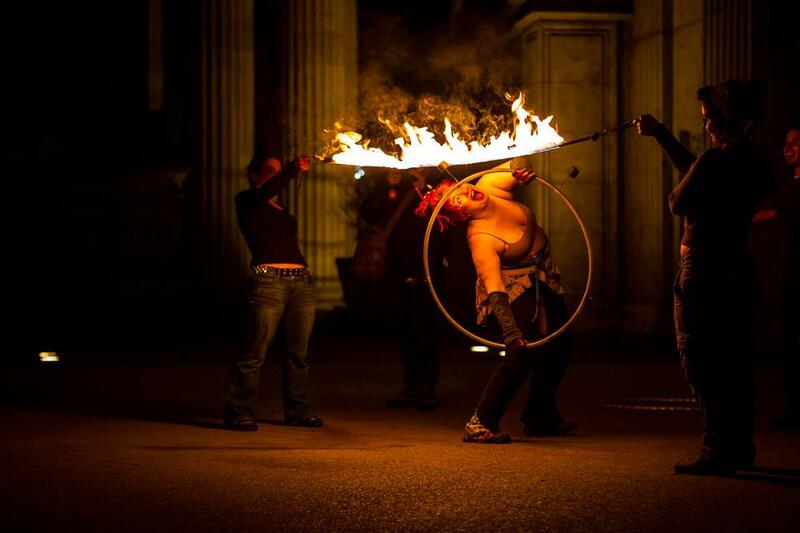 We’ll discuss your hooping needs from a short and long term perspective and various strategies for those who seek fire hooping skills. Before you leave, if you want tape, you pick the colors from our selection using the pricing below. Once you’ve selected your hoop size, we’ll take payment and then produce your hoop and at a separate time, you can pick it up at our location. Fittings and hours are by appointment only so we can ensure our attention is on you and we can answer whatever questions you may have and show you samples of what we can co-create. Want to support your practice with private instruction as well? Sign up for the beginner hoop lesson package and get 2 60-minute private sessions reduced from $330 to $260 when purchased at your hoop fitting. Want to gift one to a friend for the holidays? Get one of our limited quantity Custom Hoop Gift Certificates good for local pickup and fitting only. Email GlitterGirl directly (GlitterGirl TempleOfPoi com) to arrange for purchase. ← Beginner Poi Moves, Wednesdays, 8 PM starts 4.17.19 – Sold out! I wish we lived closer together… 3000+ miles of separation just stinks. Maybe you’ll come to Canada someday and I’ll take some lessons.